Did you know that hollow chocolate bunnies are a by-product of WWII cocoa rationing? That way, they could keep their appealing shape while using significantly less material. Smithsonian magazine reports that the chocolate bunny has existed since the 19th century when it was initially created in Germany. Gourmet.com states that these treats were hidden for kids to find around springtime to commemorate the season. Whitman’s Chocolates produced chocolate bunnies as a take on the tradition in the mid 1800s, but not everyone was keen on the idea just yet. In 1890, Robert Strohecker was the first American shop owner to use a five-foot-tall chocolate bunny as an Easter promotion in his drug store. 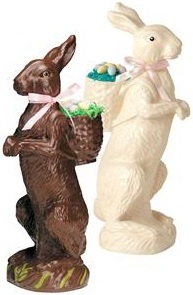 However, it wasn’t until the beginning of the 20th century when chocolate bunnies truly started taking off. As more manufacturers got their hands on chocolate molds, they began producing bunnies at a quick rate for children and adults alike during the Easter season. SweetCityCandy.com reports that Americans buy more than 60 million chocolate bunnies each year, which undoubtedly makes Easter one of the biggest candy-eating holidays. In total, this comes to about $1.9 billion, and Gourmet.com states that this is only second to Halloween candy revenue. If you think that you’re the only one who starts eating a bunny by nibbling on the ears, you’re not alone – YumSugar.com reports that 76 percent of Americans prefer to start with the top of the treat when indulging. Interesting history–it all makes sense! I didn’t know that, and I’ve eaten chocolate bunnies for a long time :D (And chocolate bunnies are so, so cute..) Interesting article, I like it a lot. And have a great easter! 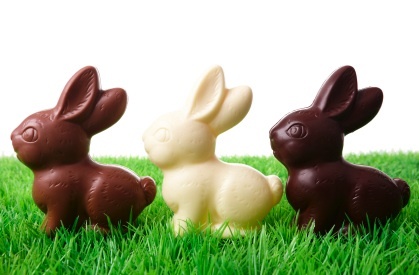 Like bunnies, they are very cute .. but chocolate bunnies – I don’t think I ever eaten one. Love chocolate so I probably miss something. Happy Easter everyone. Hollow chocolate bunnies are a good idea, even without the rationing. Who wants to break all their teeth off when trying to eat something delicious?